Have a problem on your street and don’t know who in the City to call? Want to know about crime problems in your neighborhood? Need to report a crime anonymously? The links below will provide you with this information and much more. Need to find the phone number of a City department? Like to report a pothole or broken street light? Simply dial 311 and one of the cities service representatives will assist you. You can use the 311 Form online to contact them, or tweet to @PGH311. The mission of the Pittsburgh Department of Permits, Licenses, and Inspections (PLI) is to provide life safety and a better quality of living to the residents of the City of Pittsburgh. The Department of Permits, Licenses and Inspections works closely with Public Safety Bureaus (Police and Fire), Finance, Public Works and the Department of City Planning’s Zoning Department. They review, approve, and issue all permits required by code for the repair, alteration, or addition to all public and private buildings and structures, as well as permits for new construction. service while maintaining the City’s infrastructure by resurfacing streets, preserving park facilities and rehabilitating public structures.The department also meets the environmental needs of Pittsburgh residentsby collecting residential refuse and recyclables and controlling the animal population. It also ensures public safety by responding to weather-related emergencies such as flooding, land subsidence, snow and ice storms, and other disasters. Public Works is comprised of four Bureaus, including Administration, Street/Parks Operations, Environmental Services, and Transportation & Engineering. Spot Crime is a website designed to give personalized updates of crime reports specific to your address. You can receive alerts and updates either through email or through a text message sent to your phone. The FBI’s Uniform Crime Reporting (UCR) Program collects offenses that come to the attention of law enforcement for violent crime and property crime, as well as data regarding clearances of these offenses. In addition, the FBI collects auxiliary data about these offenses (e.g., time of day of burglaries). The expanded offense data also include trends in both crime volume and crime rate per 100,000 inhabitants. Finally, the UCR Program collects expanded homicide data which includes information about homicide victims and offenders, weapons used, the circumstances surrounding the offenses, and justifiable homicides. Clicking on the map will give you a larger view. 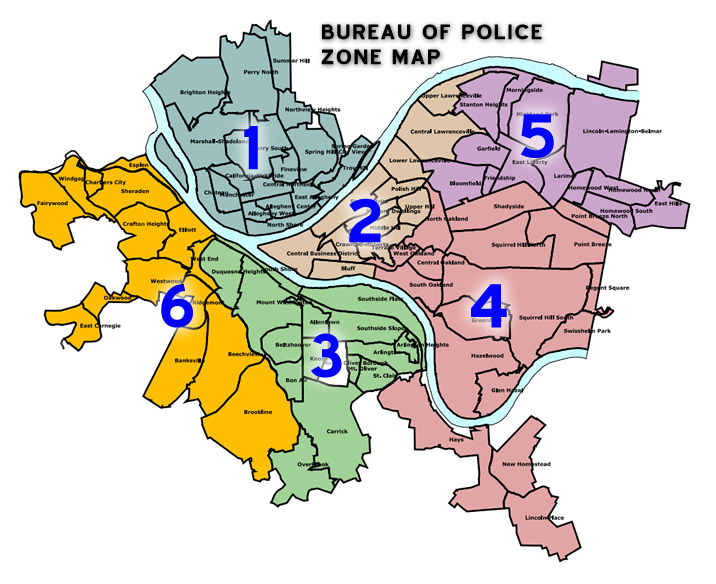 To find the webpage where this map is sourced from, and for a more detailed version, visit this link which will take you to the Pittsburgh Community Safety Website. The Pittsburgh Community Safety Website is a new initiative by the Pittsburgh Police to create a user friendly interface for the citizens of Pittsburgh. The website includes a police blotter to report crime, a section to submit a tip to police, up-to-date safety alerts, and a comprehensive list of city-wide blockwatch groups. For Allegheny County residents. Submit a tip, read the most wanted, learn about various divisions, and get info about Sheriff sales. Pittsburgh EMA works with city, county, regional, state, and federal government partners, businesses, and non-government organizations to develop all hazards plans for natural disasters and man-made events. The Citizen Police Review Board (CPRB) is an independent agency set up to investigate citizen complaints about improper police conduct. The CPRB is made up of seven unpaid board members appointed by City Council and the Mayor. Board members serve a four-year term. While serving, they oversee all aspects of complaint handling: from initial review to public hearings and meetings to recommendations, if applicable. If you can’t find the information you need, the City’s 311 line is always a helpful resource for non-emergencies.